OAKLAND — The U.S. Department of Health and Human Services awarded the Garrett County Community Action Committee with a $1,696,669 grant for Head Start. Head Start is a federal program that promotes school readiness for children under 5 from low-income households. “Head Start is a major priority for Community Action and we have been working on it for a number of years,” said Duane Yoder, president of GCCAC. The Head Start program runs from Feb. 1 to Jan. 30 and if it’s prorated it’s the largest grant that GCCAC has received, according to Yoder. “Today’s announcement of the HHS Head Start grant for Garrett County Community Action is good news for my constituents in Maryland’s westernmost county,” said 6th District Congressman John Delaney on Monday. “Head Start is one of our most important federal programs because supporting early education clearly benefits both individual children and our society as a whole. Every child in America deserves a world-class education and an opportunity to pursue the American dream. GCCAC has an Early Head Start program which is for children up to age 3 and the Head Start program is for ages 3 to 4. The Early Head Start, which has 80 children enrolled, has the largest waiting list and the Head Start program has 220 children enrolled, according to Yoder. “The Head Start school readiness scores for children coming out of Head Start, which is for low- to moderate-income students, are the same as the rest of the population. We are the only place in the state that has scores that are the same as the rest of the population,” said Yoder. Last year, the Head Start program closed for a month due to the federal government sequestration and during that time the school readiness scores dropped, according to Yoder. “We have worked very hard on this and have 11 different classes around the county and have infant home visiting,” said Yoder. The majority of the classrooms are at the Dennett Road facility and there are classrooms at Friendsville, Grantsville, Accident, Kitzmiller, Crellin and the Overlook Child Development Center in Oakland. Founded in 1965, GCCAC is a private nonprofit corporation that provides services to Garrett County residents. It is governed by a 15-member board of directors composed of community leaders. Delaney toured its headquarters in Oakland earlier this year and met with Yoder to discuss the organization’s needs and priorities. Day to Serve Is Here! Day to Serve is a unique annual event that transcends politics and religious differences. It unites people of all faiths, races, cultures, and backgrounds with the shared goal of helping those in need and improving the communities where we live. More here. and their Facebook page. Mary S. “Molly” Jameson, who established and directed two outreach programs at St. Vincent de Paul Roman Catholic Church in Baltimore, died Sunday of breast cancer at her Lutherville home. She was 81. The daughter of a building contractor and an educator, Mary Smart was born in Garrett County and raised in Oakland, Friendsville and Grantsville. After graduating from Oakland High School in 1948, she enrolled at what is now Towson University, where she earned a bachelor’s degree in 1952. Volunteers are being sought for the second cleanup of Rt. 46 from the Robert W. Craig Campground to Elk Garden, W.Va., at Jennings Randolph Lake, which is situated between Garrett County and Mineral County, W.Va. The cleanup is scheduled to take place on Saturday, Aug. 13, beginning at 9 a.m. Volunteers are to meet at the gazebo in the Howell Run Picnic Area. The group will start cleaning from both the campground and Elk Garden simultaneously, so everything will be downhill, according to Ranger Norm Dennis, coordinator of the project. He noted that as this is the second cleanup this summer along this same stretch of road, there should be far less trash then the first volunteers encountered. Beverages will be provided during the entire cleanup effort. At the end of the project, a barbecue will take place at the gazebo for all volunteers who helped. Anyone wishing to volunteer can contact Dennis at the lake office at 304-355-2346, or by e-mail at norm.dennis@usace.army.mil, or persons may simply show up at the gazebo Saturday morning. Ridgeview Valley a planned residential community located in McHenry, Maryland has found a way to give back to the community even in the rough economic times. (Press Release) – Dec 23, 2010 – McHENRY, MD. – Ridgeview Valley, Deep Creek Lake’s newest lifestyle community has found a way to give back to their local community even in rough economic times. Ridgeview Valley is located at the end of Gravelly Run Road, just north of the Rt. 219 Bridge which crosses Deep Creek Lake in McHenry, Maryland. This historic property is graced with a beautiful big red barn that was built in the early 1800’s and has needed very little in terms of refurbishing, really only a coat of fresh paint. Adjacent to the barn is a lovely hillside which has been terraced to create an outdoor amphitheater. From dairy cows to the good times ahead this barn breathes the history of the land. The amphitheater is the perfect location to enjoy family and friends while gazing at the stars and listening to your favorite performer. Ridgeview Valley has become a preferred location for special cultural events, such as performances by Theatre on the Lake and The Annual Garrett Mentors Barn Dance, as well as private parties, weddings and family reunions. All events held at the Barn at Ridgeview Valley are by or for a charity or non-profit, and proceeds from each event benefit the charity or non-profit entirely. In lieu of a facility charge, those holding private functions are asked to donate to a charity of their choice. The summer of 2010 has been very active. Paul and Jennifer Allsup of North Carolina started the summer season with their wedding reception on May 1st and chose Landon’s Library and HART as their charities of choice. Maurice and Leah Izzard of Washington, D.C. were married and enjoyed their reception in the barn donating to Brain Cancer Research. The Graves family chose Ridgeview Valley as the destination for their family reunion, which is held every 3 years somewhere in the United States. Approximately 130 people attended leading to a donation to the Allied Defense Fund. Tim & Jordan Burke of Wisconsin celebrated their special day with a Celtic wedding donating tp Garrett County Humane Society. JC & Sarah Barker of West Virginia exchanged their vows on a magnificent fall day in October, donating to Terra Alta Volunteer Fire Department. Kyle and Rachel Graser of Virginia also were married on a beautiful fall day in October and chose Bully Paws, a pit bull rescue organization as their charity of choice. For their second year at Ridgeview, Theatre on the Lake performed “Little Shop of Horrors” and “Children of Eden”. Garrett Mentors sold concessions at “Children of Eden” to promote their 2nd Annual Barn Dance, which was held in the barn on September 18, 2010. Plans are already in the works for the 3rd Annual Ridgeview Valley Barn Dance to benefit Garrett Mentors. Coldwell Banker Deep Creek Realty sponsored a free kid’s carnival day that had about 200 in attendance. They had fire trucks, games and free giveaways for the youngsters to enjoy. The final event of the season was a barn dance for members of the Jehovah Witness Hall of Oakland, MD. With this clever way of giving back to the community Ridgeview Valley offers brides a unique venue that allows them to personalize their big day, while helping their favorite charity. This season Ridgeview has supported donations of over $2,500.00 to various charities. Fun at Deep Creek Lake – 5 bdrm/5ba lake access home w/ indoor pool located on 1AC golf course/lake view lot. The open floor plan hosts 3 master suites, large living/dining/kitchen area for entertaining, 2nd family room & game room. Waterfront Greens offers a par 3 golf course, catch & release fishing pond, tennis courts & mini golf. Established Vacation Rental History. Mountainside memories will be yours forever in this lovely wooded lake access community at Deep Creek Lake. Spectacular views are afforded on many lots while others offer that tucked away privacy you are looking for. This exquisite neighborhood offers a great location plus on-site amenities including a lakeside clubhouse, tennis and basketball courts with pavilion, hiking trails and boat dock privileges. Make Mountainside your home away from home! Close to all lake activities, including Deep Creek Lake State Park & Wisp Ski & Golf Resort. Lakeside clubhouse located next to one of Deep Creek Lake’s best attractions- the Lakeside Creamery. Common areas in the community featuring tennis courts, basketball courts, a covered pavilion, a mountaintop deck showcasing the views of Deep Creek Lake & surrounding mountains, and hiking trails. 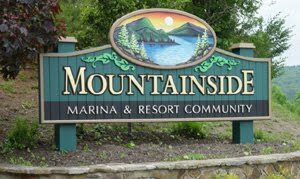 Here is a link to local news & information about Mountainside. Search Railey Realty properties for sale at Mountainside subdivision. Buying or selling real estate at Mountainside? Call Jay Ferguson!